When you edit your newsletter you have the possibility of viewing the newsletter, as it will appear when it is send to a subscriber. Furthermore you have the possibility of sending a test email to system users and test-recipients as well. In this guide we elaborate the difference between the two. When you create a user that has access to your account, i.e. a 'system user', the user's e-mail address will appear in the list in the send test e-mail overview (1). Once you create a test recipient, the recipients e-mail address will appear in the list in the send test e-mail overview (2). Once you view your newsletter you can, at the top right corner under Preview preference chose if you wish to see the newsletter as a test recipient or as a system user. The difference between the two types of recipients is that a system user is not a 'real' subscriber on the list. This means that mail merging etc. will not work for a system user the same way it does for a test recipient. 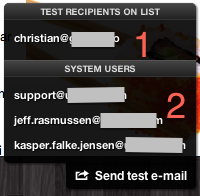 If you wish to test your mail merging you must always use a test recipient instead of a system user. This guide exemplifies and elaborates how you conduct a spam filter test as well as a preview test of how your newsletter appears in different e-mail clients. Simultaneously, the guide elaborates the functions and features that are presented during the test. THis guide elaborates how to use the search funtions in Ubivox. In this guide we show you how to delete a list in Ubivox. Be advised, that if you delete a list, all the subscribers and former newsletter will be deleted as well. If you have sold your firm, or if you for some other reason need to turn over you Ubivox account, you can do it quite easily in the system. This guide elaborates how this is done within the system. The guide also elaborates the issues you need to be aware of according to the Danish Consumer Ombudsman's directions.